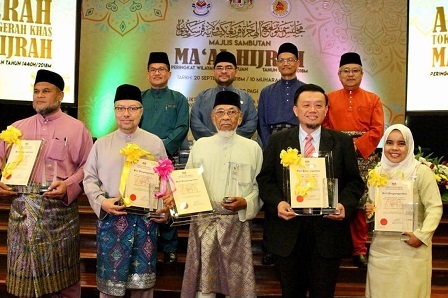 SERDANG, 21 Sept - A lecturer from the Faculty of Science, Universiti Putra Malaysia (UPM), Prof. Dr. Taufiq Yap Yun Hin received a Special Award for 1440H/2018M Maal Hijrah (Preacher Category) at the Federal Territory level, recently. 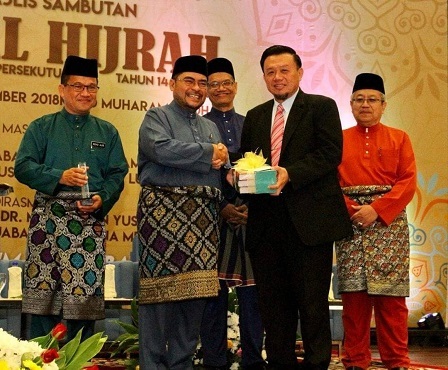 The award was presented by the Minister in the Prime Minister's Department, Dato' Dr. Mujahid Yusof, at the Islamic Centre Complex, Federal Territories Islamic Religious Department in Kuala Lumpur on September 20. Prof. Dr. Taufiq, 50, received a certificate, a plaque and cash worth RM3,000. He was also the recipient of the 2017 National Maulidur Rasul Celebration Award, and the Tokoh Maal Hijrah (Saudara Kita category) for the State of Selangor in 2012. He was overwhelmed and grateful to Allah for the award he received. "With God’s will, I will remain steadfast (istiqamah) in sharing the beauty of Islam to all mankind," he said. At the same time, he said, all Muslims must guard and maintain moral integrity in accordance with the teachings of Islam. Prof. Dr. Taufiq is also the Head of Centre of Excellence for Catalysis Science and Technology, UPM and President of the Chinese Muslim Association of Malaysia (MACMA).